I just wanted to have some inky fun last night and experimented with distress stains on two different types of card and on canvas with and without gesso. 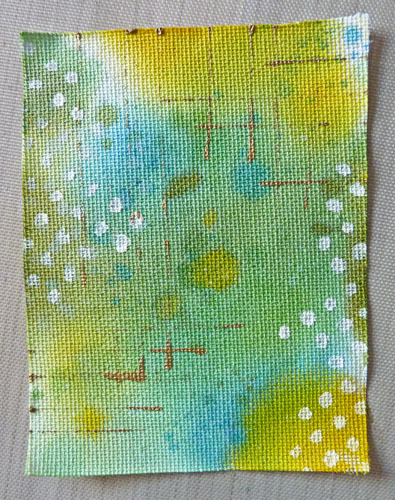 I need a birthday card for my teenage granddaughter so decided to enter the Stampotique challenge - Oodles of Doodles - as it's such a long while since I have done so and made this, using the top piece of card. Over the inky and paint layers I added an inky frame, stamped onto tissue paper and glued on, stamped the heart border, punched some extra hearts and lots of doodling round the edges, round the frame, on the punched hearts and made the birthday tag. Hey-ho complete. Sooo good to be getting back into the swing of things. For those who know me, hubbie is home from hospital, having had a scan and an endoscopy. Some bits wrong like hiatus hernia, gastritis and sludgy gall bladder and he will have that out in May. So we are hoping he doesn't get the awful pain back again before he has to go in and have the gall bladder out. Here's hoping!! 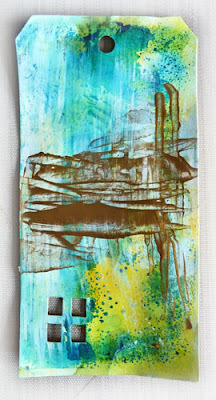 Oh, I do like both canvases - although I think I like one without gesso just a bit more. The card is great. I need to get me one of those punk girl stamps..... Hmm, but I'm trying to reduce. Oh well. Gorgeous trials, Brenda...and I was quite surprised when I saw how it turned out...what a brilliant card for your granddaughter!! Hope everything turns well for your hubby! This is so cool! Love all the techniques and the card is adorable! oh wow what fabulous colours and techniques . I am sure that card will be loved ! 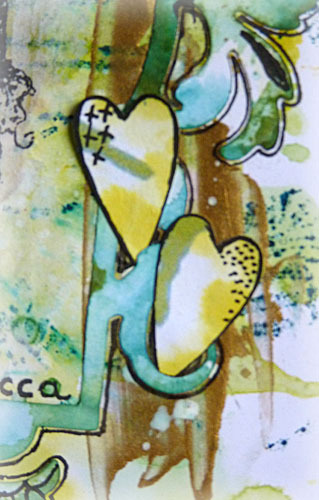 I adore the card you've made from the background to all the fab doodling! And the other background are lovely too. Best wishes for your hubby. If I had a 'sludgy' Gall Bladder I think I would want it out!!!! I envy anyone who can just let go on a substrate and finish up with a creation that can be used! I have tried many times, but because I like to be in control, it is very difficult for me to be loose with any design and trust myself, I have had few successes, but having said this I enjoyed the process very much, and I can well imagine you had great fun doing these four, plus you know that everyone can be used wonderfully on anything you want to extend it to. Your completed card is artistic and unique with a plethora of messy flair, I just love it. A wonderful card, very nice backgrounds too! Wishing your husband well and hope the pain stays away. Hello lovely Brenda sorry to hear about your Hubby, I hope all goes OK for him, my friend had to have that op lasst year and she is fine now. I totally love all your experimenting! everyone is fab - you've mastered this creative ink thingy now Sir Tim needs to watch his back! The card is fabulous and I think your Granddaughter will just love it! LOVE (love, love) today's makes - ALL of them. 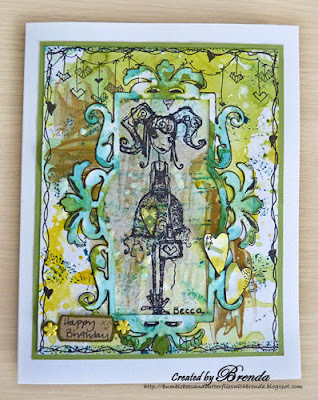 Fab doodly card !! Love the colours ! 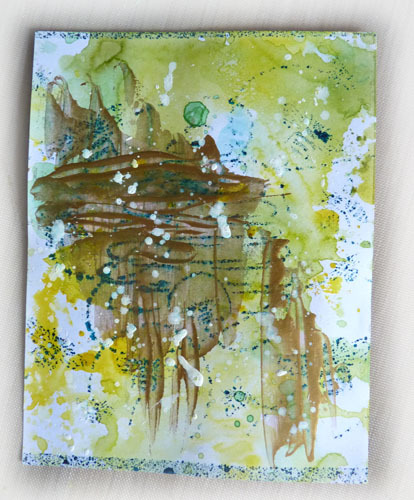 Wonderful card and great doodling experiments! Thanks for joining us at SDC 52. I see you have had a really good play and I like the results.........scrummy! Like what you did with your playtime, such a perfect card for a teenager. Wow! Gorgeous background. 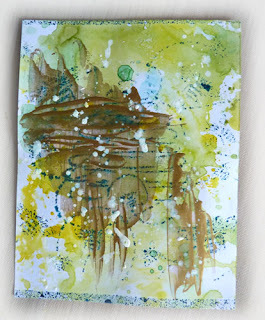 Thanks for joining us at Stampotique Designers Challenge. Love your colors and all the different looks you've achieved.... that canvas w/o gesso is my fave. Can't wait to see what you make with all these beauties! So cool, such a fantastic page, the background is perfect for this image. 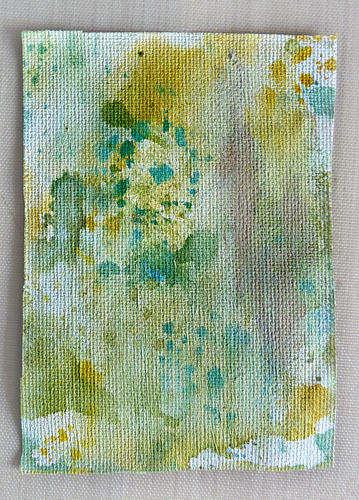 Adore all the different backgrounds you created with the paints. Beautiful doodling on the birthday card. Thanks for joining us at Stampotique Designer's Challenge.